Baruch Dayan Ha'emes: In the Sha'arei Tzedek hospital in Jerusalem, yesterday (Motzaei Shabbos) the Gaon Rabi Ezra Nissim Ades zt"l – one of the Rabbonim of Hertzelia, was niftar after an illness. 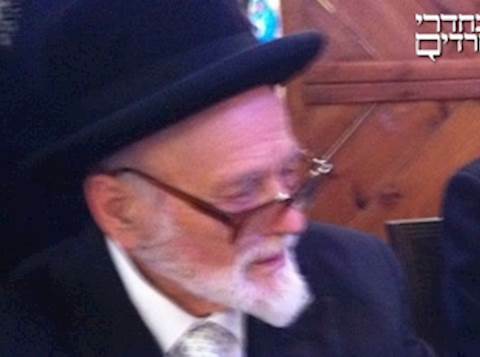 The deceased zt"l was born to his father, the Rosh Yeshiva of Porat Yosef and the Av Beis Din of Yerushalayim, Hagaon Rabi Yaakov Ades zt"l.
In the past, he served as the Rav of the kehilla Shaarei Tzedek in Manchester, England, and during the last years he lived in Hertzelia and was one of its Rabbis. His acquaintances tell of an awesome Gaon who was familiar with all walks of Torah, was a man removed from worldly life, and beloved to all who knew him. He left after him blessed generations, his wife תחי', sons and daughters, sons-in-law and daughters-in-law, and descendants. His Levaya will leave this morning (Sunday) at 11:30 from the Kol Yaakov Yeshiva in the Bayit Vegan neighborhood, at the head of which stands his younger brother, Hagaon Rabi Yehudah Ades יבדלחט"א – to Har Hamenuchos. The family members will sit Shiva on 23 Frank st., Bayit Vegan, Jerusalem. May his soul be cherished for eternal life.